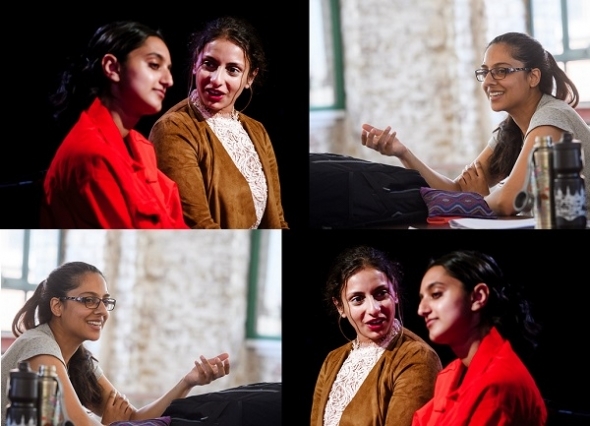 IT TELLS the story of two friends, ‘Safa’ (Humaira Iqbal) and ‘Aisha’ (Aasiya Shah) who have grown up together in East London, bunked off school, gone to the same university and now are about to embark on different paths in their working life. Safa is about to begin a job in the City where she is exposed to a large number of white-middle class people, while Aisha becomes a teaching assistant at her old school. Hussain packs a lot in this two-hander about what it is like to be a British Muslim in East London – the London Bombings, class, race, friendships and loyalty. In a piece for The Guardian (see link below), she talks about “being a working class person of colour in a white-middle class workplace,” and this is one of the key issues in the play. It’s as though Safa and Aisha are two sides of the author, who has wrestled with similar issues in real life. It’s an anecdotal play about two people in the middle (i.e. they are unremarkable in the way they see the world, mostly) and how the external things that happen to them, such as micro aggressions in the work place alter their sense of self, she explained to www.asianculturevulture.com. Hussain, who worked in Central London found it a “weird environment” and tried to fit in but “felt like an imposter at the time”, and her essay has been prompted by those feelings but it’s not something she feels now. “We hate ourselves” is a line in the play. Hussain explained the play dwells on the idea of what privilege can do to you and how it can affect your sense of self and make you pick away your culture and internalise racism. The young playwright was born and brought up in Newham and is the eldest of three siblings. Her parents are from Mirpur, in Pakistani Kashmir and she went to Plashet School for girls and then onto the Sixth Form at Valentines High School in Redbridge. Although she didn’t have much exposure to theatre as a youngster, Hussain said, she always loved stories and reading and felt driven to write, and thought it was something she would pursue in later life, while doing an office job now. With that in mind, she that went to Brunel University and read Politics and English Literature, followed by a Master’s degree in Global and Comparative Politics at Queen Mary University of London. Later, she worked in communications, but was unhappy and started to attend writing workshops, with Kali Theatre and The Royal Court. She also joined the Tamasha Playwriting course in 2016 and is full of praise for the director, Fin Kennedy “who offers a unique programme where he teaches you to have a career”. After writing a few short plays as part of her training, she submitted ‘Spun’ to the ARCOLA PlayWROUGHT Programme but was rejected. However, she met Richard Speir (a director who works at Arcola) who said he would love to direct it and the rest is history! Hussain is a unique and distinctive voice and the play has opened doors for her. She is undertaking a BBC Drama Room programme to get introduced to writing for television, and is part of the Tamasha and Hachette Creative Writing Programme aimed at writers of colour interested in writing prose fiction and non-fiction. The Guardian essay reveals the unease at which she was made to feel that she was working class and how it differed from the more obvious perception of just looking different.